Socially is a Mobile Social networking integrator application developed by Mumbai based Antarix Networks. 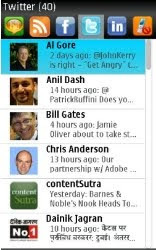 Socially provides a unified interface to all popular social destinations like Twitter,Facebook,LinkedIn .with socially you can track your social stream right from your cellphone. Socially has some interesting feature set which make it stand out in a crowded marketplace . You can download socially by pointing your mobile browser to http://m.sociallyapp.com . It can also be downloaded from Nokia’s Ovi Store (here), GetJar (here).Socially is supported for symbian Platform and specifically Nokia Handsets. you can find a complete listing of supported handset here. It has a memory foot print of 889kb . It took me 5 min on GPRS connection and 2-2.5 Min on Wi-Fi to download the client on my Nokia N97 and Nokia E63 respectively.Installation went smoothly . After installation you are welcomed with a tabbed interface . Each tab is dedicated to one social network . right now there are 6 Tabs .one for Facebook,Twitter,LinkedIn each. other tabs are for Updating your status ,viewing an integrated stream,Blockcalls etc. I am sure that there would be additional tabs as and when they add support for new social destinations. For the first time you need to provide your login credential to login to each social network .after that you can watch your integrated social stream every time you log in. In addition to these aggregation , Socially also provide some Mobile phone specific feature too. it provide a deep integration with your social graph by connecting your phone data. these functionality can be clubbed under two broad categories . Event based information and Status Ticker. Status Ticker: After installation Socially works in background , you keep receiving status update alert on your phone screen in the form of a ticker.this ticker works as a teaser , providing a temptation to engage in conversation.User can see latest update from their friends with out going to application interface.if you want to respond to it or know more detail you can click on it and it will take you to the main app screen .its an excellent use of phone's idle screen if you ask me . One might think that it will be preventing user from moving application interface and thereby reducing page view of app but on the contrary people tend to visit the application interface more often if they got to see the teaser of status ticker. I speak for myself , i find my self repeatedly visiting the app interface most of the time when I see an interesting update on my ticker. Event based information : These information are displayed in response to an event like incoming calls. For example whenever you receive a phone call it shows you a summary of your previous interaction with the caller . things like when was the last time you talked or sent an SMS to caller , their current location and latest status message etc.This can be of huge value add to reciver as it put an context to the call. Apart from providing the updated status info on receiving call .Socially also provide an option to add calling party to your facebook /Twitter account or to block call from that number,once the call is terminated. On distribution and Monetization front socially has got some good potential . Its available on Ovi and Getjar . It has also been launched with Reliance Communications, R World User can download the app for free and do unlimited browsing on Linkedin, Facebook and Twitter by paying 10 Rs /Month . This price point make it very tempting for its primary audience : young cellphone users. I am sure any advertiser would like reach out to them .Apart from the Subscription revenue , Socially can also moentize its usage by inserting advertisement on Ticker . This kind of idle screen advertisement has been around for sometime , another products which use such method is Celltick and SMS 2.0. Do try out Socially and let me know how you feel ? I really liked your blog and very informative. It frequently is amazing to me how site owners such as yourself can find some time along with the dedication to carry on composing outstanding discussions. Your website isgreat and one of my personal need to read websites. I just needed to say thanks.